This is the fifth of a five part series. This topic is covered in the companion page Quartiles for Box Plots. 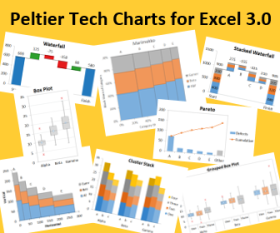 Peltier Tech Charts for Excel provides a number of quartile methods, including Tukey’s Inclusive Hinge method, the Moore and McCabe Exclusive Hinge method, the CDF hinge technique used by default in SAS, the (N+1) Basis Interpolation approach used by Minitab and several other packages, the (N) Basis technique, and the (N-1) calculation used in Excel. The CDF calculation is selected by default, but this option can be changed in the simple listbox, inserted in the worksheet next to the box plot.